The name 'Chula' appears to have been a very popular one among fanciers of Siamese. There are at least three early 'Chula's' listed in the famous Siamese Cat Register of 1924, produced by Major Sydney Woodiwiss3. They date from 1906 through to 1913. But this 'Chula' who was born in the United States, and her dam, who was named 'Chula the Elder' are two examples that pre-date all three in that Register. The photo of Miss Payne's 'Chula' and her story, appear in the August 1903 edition of The Ladies Field. "Many stories are told to account for the peculiarities of the breed, the kinked tail and the squinted or crossed eyes. My favourite is the one about the two cats who lived in a remote temple with an old priest. The elderly gentleman passed to his reward, and the cats were left without a guardian for the temple. Chula the female, discussed the matter with her mate, Tien, and they decided that she should stay to watch over the one treasure of the temple, a jewelled cup, while Tien went in search of a young priest to take over the duties of the temple. Tien was gone for some weeks and poor Chula found her duties burdensome, so she solved the dilemma by curling her tail tightly about the stem of the cup, so that she could sleep, knowing that nobody could steal the chalice without waking her. During her waking hours, she stared fixedly at the cup, assuring herself that it was truly safe. Both parents were imported from Siam, by Hong Kong to San Francisco. "she will never allow anyone to whistle"
"Chula is my constant companion; she does everything but talk in our language. I say 'our', for I know she holds long conversations in her own tongue, and I am getting to understand her very well. She can retrieve just like a dog, but with this exception. The only thing she will fetch is a roll of paper tied with a red string; she has always turned up her nose at any other colour. 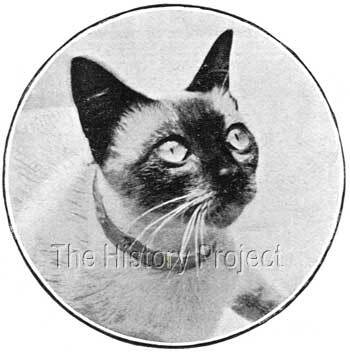 Siamese female owned by Miss Louise Payne of 'The Maizee' cattery, Los Angeles.